Let’s face it, a muffin is just a muffin. Well, until you add frosting that is, then and only then, does it become a cupcake! My kids were not very excited when I said I was making zucchini muffins. They were, however, very excited when I said I was making Apple Cinnamon Zucchini Cupcakes! Everything is better with cupcakes! 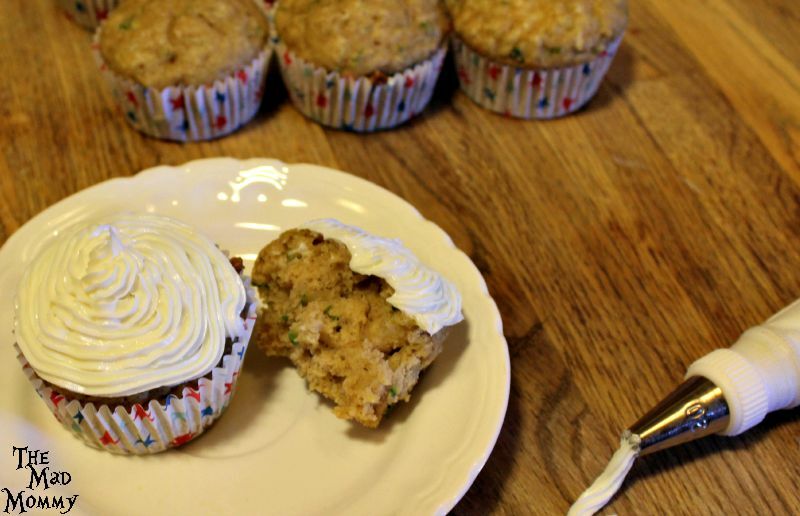 This is a great recipe for amazingly moist and delicious zucchini muffins cupcakes! My kids could barely wait for them to cool and they completely devoured them! Mix together your dry ingredients (flour, baking soda, baking powder, cinnamon, salt) and then toss your zucchini in the dry ingredients. This helps with distribution. Start with 2 cups of flour and then, if it seems to liquidy after the next step, you can add more. Mix together you wet ingredients (eggs, vanilla, apple sauce, sugar) and then pour them into the dry ingredients. Combine thoroughly. Place about 1/4 cup of the batter into each cupcake liner. You can use a measuring cup or an ice cream scoop, like I do! Bake them in the oven for 15-18 minutes. Make sure a toothpick comes out clean. Allow them to cool (if you can), frost them and serve! Everything is better with #cupcakes! 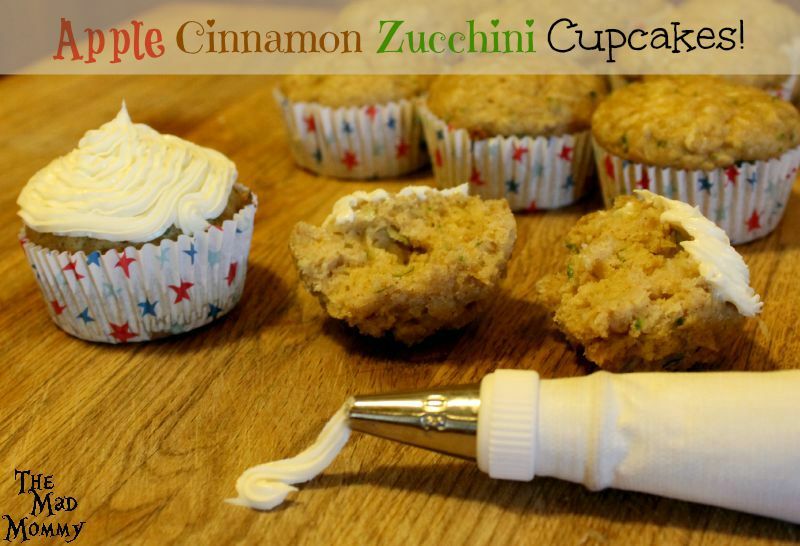 Try this Apple Cinnamon Zucchini Cupcake #recipe! Everything is better when it's a cupcake! Just like this Apple Cinnamon Zucchini cupcake recipe! A frosting of your choice! I used a vanilla frosting. Have you ever tried a zucchini cupcake? All I can say is yum and thank you for this recipe. I have zucchini coming out of my ears and this looks like just the treat. Thank you! This is a perfect recipe for using up zucchini! Cream cheese frosting would be amazing on these too! I might even make a batch and add carrot to them! My kids would LOVE these! They sound great! I love cupcakes! I just haven’t tried one with zucchini in it! Does it taste any different? You won’t even know the zucchini is there, Jhanis! Yum! I wish I had more zucchini now! I’ve been thinking about this a lot lately the difference between cupcakes and muffins. My kid loves cupcakes, but not muffins so much. I just have to put healthy frosting on some muffins and call them cupcakes. Genius! My kids ate it up, LOL! Everything is better as a cupcake! It’s certainly a genius idea! I never really knew the difference between muffins and cupcakes anyway, but I think frosting makes everything better and more palatable. A little frosting helps almost everything! 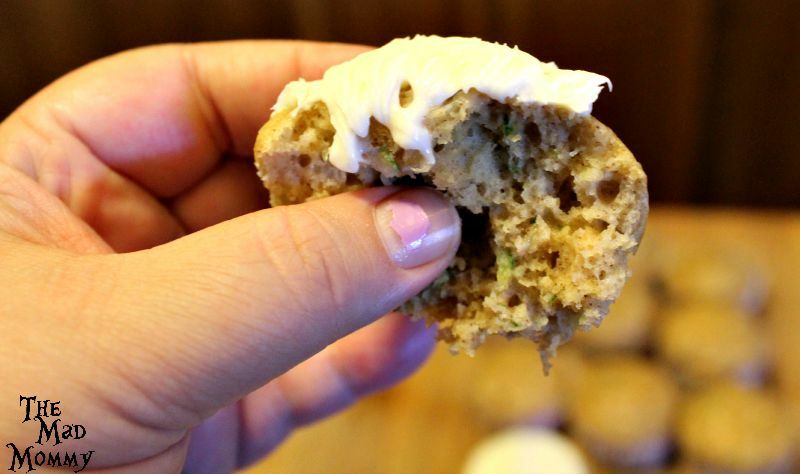 I love zucchini in baked goods, so this cupcake recipe makes my little heart jump for joy. Thank you for sharing, I can’t wait to try it for myself. I love Zucchini bread, so these were awesome for me and my kids ate them up! Looks delicious! I’ll have to give it a try some time! My favorite types of cakes are zucchini and banana!! yum! I adore banana and zucchini bread too! You will love these cupcakes! Thank you for supplying a printable version. This is now in my recipe “box” in OneNote. YAY! I’m so glad that came in handy! We buy zucchini muffins from costco and my daughter loves them. I would love to try your recipe at home, esp with the frosting! Making them at home is always better! Have your daughter help! Desserts are the only way any of us like or will eat zucchini in our house. When you bake them in to cupcakes, you can’t even taste it, but you know it’s a bit healthier when you eat it. It makes you feel a little better about eating 2 or 3, LOL! These really do sound delicious-I would probably leave off the frosting and cut the muffins in half and add some sweet butter. They are delicious with butter too! I eat them like that more than with the frosting! My girls love cupcakes. Thia sounds yummy and I’m sure my kids will love this. I bet they will too! My kids absolutely loved them! I have never had a zucchini cupcake. Great way to get the kids to eat their veggies! Oh it looks so good! I’m not the best baker due to high elevation, things just don’t turn out right, but I want to give these a try! Those look great! What a awesome way to “sneak” veggies in for kids! yum. these cupcakes look amazing! I have several zucchini I need to use! Those look so good. We had a garden last year and grew a ton of squash. These would have been perfect. I will bookmark this recipe for sure. Great Photos. My grandmother used to make zucchini bread all the time and I so miss that. This is one recipe I am going to be making for sure. These cupcakes sound and look so delicious. Thanks for sharing. Oh my gosh these cupcakes look delicious! I have never thought to use Zucchini like this before!! These are so tempting!!! I wanna grab one of your cupcakes from my screen lol 😀 I’m gonna try your fantastic recipe and I’m sure my family would love it. These look so good. I just pinned because I definitely want to make them. They sound like a great healthy treat! These looks so good! I love zucchini bread, and I bet the combination with apples makes them so good. A perfect Fall recipe! Oh my goodness, these sound great. I love having a stash of muffins for quick go-to snacks. I have a whole bunch of zucchini from my father-in-law too! Omg genius! My daughter is frosting obsessed…. This is a pretty cleaver way to get those veggies in! Totally gunna give this a try! How funny – I’m actually eating zucchini cookies as I type this! I would live to try a cupcake recipe like this one. Thanks for sharing!